For other uses, see Charlottetown (disambiguation). Charlottetown (/ˈʃɑːrləttaʊn/; French pronunciation: ​[ʃaʁlɔt.tawn]; Scottish Gaelic: Baile Sheàrlot) is the capital and largest city of the Canadian province of Prince Edward Island, and the county seat of Queens County. Named after Charlotte of Mecklenburg-Strelitz, queen consort of King George III of the United Kingdom, Charlottetown was originally an unincorporated town that incorporated as a city in 1855. It was famously the site of the Charlottetown Conference in 1864, the first gathering of Canadian and Maritime statesmen to debate the proposed Maritime Union and the more persuasive British North American Union, now known as Canadian Confederation. From this, the city adopted as its motto Cunabula Foederis—"Birthplace of Confederation". The population of Charlottetown in the 2016 census was 36,094; this forms the centre of a census agglomeration of 76,728, which is slightly less than half of the province's population (155,241). 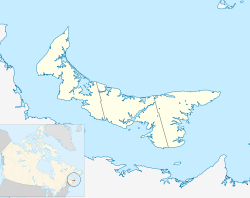 The first European settlers in the area were French; personnel from Fortress Louisbourg founded a settlement in 1720 named Port La Joye on the southwestern part of the harbour opposite the present-day city. This settlement was led by Michel Haché-Gallant, who used his sloop to ferry Acadian settlers from Louisbourg. Charlottetown was named for Queen Charlotte, queen consort of King George III. During King George's War, the British had taken over the Island. French officer Ramezay sent 500 men to attack the British troops in the Battle at Port-la-Joye. The French were successful in killing or capturing forty British troops. In August 1758, at the height of the French and Indian War, a British fleet took control of the settlement and the rest of the island, promptly deporting those French settlers that they could find in the Ile Saint-Jean Campaign (this being fully three years after the initial Acadian Expulsion in Nova Scotia). British forces built Fort Amherst near the site of the abandoned Port La Joye settlement to protect the entrance to the harbour. Charlottetown was selected as the site for the county seat of Queens County in the colonial survey of 1764 by Captain Samuel Holland of the Royal Engineers. A year later, Charlottetown was made the colonial capital of St. John's Island. Further surveys conducted between 1768–1771 established the street grid and public squares which can be seen in the city's historic district. 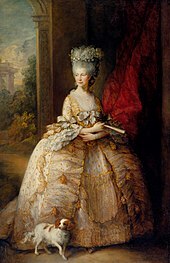 The town was named in honour of Charlotte of Mecklenburg-Strelitz, queen consort of the United Kingdom as the wife of King George III. On November 17, 1775, during the American Revolution, the colony's new capital was ransacked by Massachusetts-based privateers in the Raid on Charlottetown (1775). During the attack, the colonial seal was stolen and several prisoners, including Phillips Callbeck and Thomas Wright, were taken to Cambridge, Massachusetts and later released. In 1793, land had been set aside by Governor Fanning on the western limits of the community for use by the "Administrator of Government" (the Governor), and as such it became known informally as "Fanning's Bank" or just "Fanning Bank". On November 29, 1798, St. John's Island was renamed to Prince Edward Island in honour of Prince Edward, Duke of Kent and Strathearn who was the Commander-in-Chief, North America. In 1805, the local British garrison constructed a harbour defence called "Fort Edward" to the west of the capital's waterfront and the "Prince Edward Battery" manned this facility. In 1835, "Government House" was constructed at Fanning Bank as a residence for the colony's Governor. Today, it serves as the official residence for the Lieutenant Governor. Between 1843 and 1847, a new legislative building was constructed in the community. Named the Colonial Building originally, following Confederation with Canada it gradually became known as "Province House". The completion of this structure with Isaac Smith as builder/architect was an important milestone in the history of the capital and it is still in use today as the provincial legislature as well as a National Historic Site, and is currently the second-oldest legislative seat in Canada. 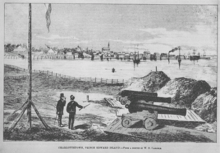 On April 17, 1855, Charlottetown was incorporated as a city, holding its first council meeting on August 11 of that year. The community had 6,500 residents at the time of incorporation. Members of the Charlottetown Conference, a conference to discuss Canadian Confederation, in front of Government House in 1864. Between September 1–8, 1864, Charlottetown hosted what is now termed the Charlottetown Conference. Although many of the meetings and negotiations which would lead to Canadian Confederation were held in Province House, various social events spilled over into the surrounding community. View of Charlottetown in 1872, one year prior to Prince Edward Island's entry into Canadian Confederation. Prince Edward Island entered Confederation on July 1, 1873. Aside from being the seat of colonial government, the community came to be noted during the early nineteenth century for shipbuilding and its lumber industry as well as being a fishing port. The shipbuilding industry declined in the latter part of the nineteenth century. On June 14, 1873 the "Government House Farm" at Fanning Bank was designated a municipal park, named Victoria Park in honour of Queen Victoria. In August 1874, the Prince Edward Island Railway opened its main line between Charlottetown and Summerside. The railway, along with the shipping industry, would continue to drive industrial development on the waterfront for several decades to come. The province's first health care facility, the Charlottetown Hospital, was opened by the Diocese of Charlottetown in 1879, which was followed by the publicly operated Prince Edward Island Hospital in 1884. Religion played a central role in the development of Charlottetown's institutions with non-denominational (i.e. Protestant) and Roman Catholic public schools (Catholic Queen Square, Notre Dame, and St Joseph's vs. Protestant West Kent and Prince Street), hospitals (Prince Edward Island Hospital vs. Charlottetown Hospital), and post-secondary institutions (Prince of Wales College vs. St. Dunstan's University) being instituted. St. Dunstan's was originally developed as a seminary for training priests, and the Maritime Christian College was founded in 1960 to train preachers for the Christian churches and churches of Christ in Prince Edward Island and the Maritime Provinces. As with most communities in North America, the automobile shaped Charlottetown's development in the latter half of the twentieth century, when outlying farms in rural areas of Brighton, Spring Park, and Parkdale saw increased housing developments. The Charlottetown airfield in the nearby rural community of Sherwood was upgraded as part of the British Commonwealth Air Training Plan and operated for the duration of World War II as RCAF Station Charlottetown, in conjunction with RCAF Station Mount Pleasant and RCAF Station Summerside. After the war the airfield was designated Charlottetown Airport. Charlottetown's shipyards were used extensively during World War II, being used for refits and upgrades to numerous Royal Canadian Navy warships. Further post-war development continued to expand residential properties in adjacent outlying areas, particularly in the neighbouring farming communities of Sherwood, West Royalty, and East Royalty. In 1959, the suburban village of Spring Park was amalgamated into the city, extending the city's northern boundary from Kirkwood Drive to Hermitage Creek and included the campus of St. Dunstan's University. Entrance for the Confederation Centre of the Arts. The Centre was opened in 1964, to commemorate the centennial of the Charlottetown Conference. To commemorate the centennial of the Charlottetown Conference, the ten provincial governments and the Government of Canada contributed to a national monument to the "Fathers of Confederation". The Confederation Centre of the Arts, which opened in 1964, is a gift to the residents of Prince Edward Island, and contains a public library, nationally renowned art gallery, and a mainstage theatre which has played to the Charlottetown Festival every summer since. In the 1960s, new public schools were constructed in the community, and in 1969 the city became home to the amalgamated University of Prince Edward Island (UPEI), located on the campus of the former St. Dunstan's University. Together with the federal Department of Agriculture and Agri-Food's Charlottetown Experimental Farm (also known as Ravenwood Farm), these properties comprise a large green space surrounded by the city. The Prince of Wales College downtown campus became part of a new provincial community college system named Holland College, in honour of the island's famous surveyor. The PEI Comprehensive Development Plan in the late 1960s greatly contributed to the expansion of the provincial government in Charlottetown for the next decade. Campus of the University of Prince Edward Island. In 1969, two local post-secondary institutions, Saint Dunstan's University and Prince of Wales College, amalgamated to form UPEI. The Queen Elizabeth Hospital opened in 1982. In 1983, the national headquarters of the federal Department of Veterans Affairs was moved to Charlottetown as part of a nationwide federal government decentralization programme. In 1986, UPEI expanded further with the opening of the Atlantic Veterinary College. Throughout the 1970s and 1980s, there was increased commercial office and retail development. A waterfront hotel and convention centre was completed in 1982 and helped to encourage diversification and renewal in the area, leading to several residential complexes and downtown shopping facilities. The abandonment of rail service in the province by CN Rail in December 1989 led to the railway and industrial lands at the east end of the waterfront being transformed into parks and cultural attractions. In the late 1990s and 2000s, the retail landscape changed with the opening of big box stores on the site of former traditional shopping centres and in new developments in the northern suburbs, particularly the neighbourhood of West Royalty, which is a key road junction. On April 1, 1995, Charlottetown amalgamated with the Town of Parkdale and the incorporated communities of East Royalty, Hillsborough Park, Sherwood, West Royalty, and Winsloe. At the same time, the amalgamated Charlottetown annexed Queens Royalty. Today, the City of Charlottetown occupies parts of the Lot 33 and Lot 34 townships. The central business district continues to undergo incremental expansion as government and private sector office space is constructed and new institutional space is built or retrofitted, however retail space in the CBD has suffered as a result of outlying big box retail construction in recent years. Charlottetown is situated on its namesake harbour. The harbour leads into the Northumberland Strait. Charlottetown is situated on its namesake harbour, which is formed by the confluence of three rivers in the central part of the island's south shore. The harbour opens onto the Northumberland Strait. The city is roughly V-shaped (pointed to the south) and constrained by the North (Yorke) and the Hillsborough (East) Rivers to the west and east. Charlottetown has a humid continental climate (Köppen Dfb) moderated partially by Prince Edward Island's location in the Gulf of Saint Lawrence. Winters are somewhat milder than many inland cities at a similar latitude: the January average is −7.7 °C (18.1 °F), and lows reach −20 °C (−4 °F) or below on an average 7 days per season. However, the coastal position means that winter precipitation, more often as snow, is frequent and at times heavy: the seasonal snow average is 290 centimetres (114 in). Spring warming is gradual due to the ocean waters still being cold. Summers are mild, again due to the same maritime moderation: the July high is 23.2 °C (73.8 °F). Precipitation averages 1,158 millimetres (46 in) per year, with the greatest amounts falling in late fall and winter. The highest temperature ever recorded in Charlottetown was 36.7 °C (98 °F) on 19 August 1935. The coldest temperature ever recorded was −32.8 °C (−27 °F) on 29 January 1877. Downtown Charlottetown includes the city's historic five hundred lots, as surveyed by Captain Samuel Holland, as well as the waterfront facing the harbour and the Hillsborough River. Adjacent communities to the original downtown included Brighton, Spring Park, Sherwood and Parkdale. The areas to the west, north and east of downtown have been developed in recent decades with several residential and commercial/retail developments, although the outer regions of the city are still predominantly farmland, as is an area in the centre of the city where an Agriculture Canada experimental crop research station is located. The Agriculture Canada research station farm is the last remnant of the Queens Royalty common pasture lands and creates a large greenspace in the centre of the city, north of downtown. The development of the township of Queens Royalty, with its 5-hectare (12-acre) estates surveyed during the 18th and 19th centuries along a north-south axis forced early road networks into a grid. The original municipal boundary between Charlottetown and the common area of the township of Queens Royalty was the northern edge of the original five hundred lots along present-day Euston Street. This boundary was extended north to Allen Street and Kirkwood Drive during the early twentieth century, taking in part of the rural community of Brighton west of the downtown. The village of Spring Park was amalgamated into the city in 1959, extending the city's boundary north to Hermitage Creek, which also formed the southern boundary of the village of West Royalty. Development filled in most vacant land in the Brighton and Spring Park neighbourhoods by the 1980s. Municipal amalgamation in 1996 saw the outlying independent municipalities of Parkdale (town), Sherwood, East Royalty, West Royalty and Winsloe (villages) merged into a larger city of Charlottetown at the same time as rural communities east and west of the city were amalgamated to form the towns of Stratford and Cornwall respectively. A green belt is in place around the northern fringe of the municipal boundary, although it is poorly enforced by the provincial government, leading to suburban sprawl. Province House houses the Legislative Assembly of Prince Edward Island and was the location for the Charlottetown Conference. The city's streetscape with a centrally planned downtown core containing many Victorian-era houses and buildings is an attraction, as well as the waterfront redevelopment project in recent decades which has seen walking trails and parks developed on former industrial lands. A new cruise ship terminal was opened by the port authority in September 2007 which, proponents hope, will make the city a more attractive destination for the growing number of vessels operating in the Gulf of St. Lawrence. Popular attractions within the city include the provincial legislature at Province House, which hosted the Charlottetown Conference, as well as Founders Hall, a recently redeveloped railway maintenance building which now houses an interactive trip through history tracing the development of Canada as a nation. The Confederation Centre of the Arts provides live theatre, including the Charlottetown Festival during the summer months, as well as a nationally ranked art gallery. The Charlottetown Festival itself is headlined by Canada's most popular and longest-running musical, Anne of Green Gables - The Musical, which is an adaptation of Island author Lucy Maud Montgomery's novel. Several other small theaters and galleries can be found immediately surrounding the Confederation centre including the Mac (MacKenzie theatre), the Arts Guild, and Pilar Shepard gallery. There are 11 National Historic Sites of Canada located in Charlottetown, including Province House and the Confederation Centre of the Arts. The UPEI Panthers practicing at MacLauchlan Arena. The team is one of several amateur varsity teams in the city. Charlottetown has numerous parks and playing fields for soccer, baseball, softball, football, rugby, and field hockey. Cricket also has been gaining popularity after building a ground and a cricket pitch at Tea hill park in Stratford. There are also many outdoor tennis courts, recreational trails, and running tracks. Most public schools in the city have gymnasiums available for public use outside of school hours and there are community-owned and operated hockey arenas and swimming pools, as well as several privately operated fitness centres. Amateur varsity team sports are prevalent for males and females in the city's two senior high schools, Colonel Gray and Charlottetown Rural, as well as the University of Prince Edward Island's varsity teams (the UPEI Panthers) through the institution's affiliation with Canadian Interuniversity Sport. Holland College also has varsity teams, the Holland Hurricanes. There is one junior hockey team in the community: the Quebec Major Junior Hockey League's Charlottetown Islanders. The city is also home to the Island Storm of the National Basketball League of Canada. According to the 2006 census, the City of Charlottetown had 32,174 residents of whom approximately 45.5% were male and 54.5% were female. Children under five accounted for approximately 4.3% of the resident population of Charlottetown. This compares with 4.9% in Prince Edward Island, and 5.3% for Canada overall. Charlottetown is mainly dominated by people of European ancestry, but there is a growing Black-Canadian and Chinese-Canadian population. In 2006, 17.2% of the resident population in Charlottetown were of retirement age (65 and over for males and females) compared with 14.9% in Prince Edward Island and 13.7% in Canada; therefore, the median age is 41.3 years of age compared to 40.8 years of age for Prince Edward Island and 39.5 years of age for all of Canada. According to the 2001 census, the median income for a household in the city is $52,996, and the median income for a family is $77,008. Males have a median income of $42,519 versus $28,136 for females. The per capita income for the town is $29,710. 12.2% of the population and 8.0% of families are below the poverty line. Out of the total population, 9.6% of those under the age of 18 and 10.3% of those 65 and older are living below the poverty line. Between the 2001 and 2006 census, the population of Charlottetown fell by 0.2%, compared with an increase of 0.4% for Prince Edward Island as a whole. Population density of Charlottetown averaged 725.8 people per square kilometre, compared with a provincial average of 23.9 people per square kilometre for Prince Edward Island. The Charlottetown census agglomeration area (CA) comprises Charlottetown and the neighbouring towns of Stratford and Cornwall, as well as adjoining rural areas of central-eastern Queens County, namely Lots 31, 34, 35, 36, 48, 49 and 65. At the time of the 2018 population estimate, the resident population for the CA was 76,728 people over an area measuring 728.03 square kilometres, compared with a resident population in the province of Prince Edward Island of 155,241 people. According to the 2001 Statistics Canada census, more than nine out of ten inhabitants of the Charlottetown metropolitan self-identified as Christian. This breaks down to 91.7% Christian (46.0% Roman Catholic, 42.6% Protestant, and 3.0% other Christian mostly Orthodox), 7.3% stating no religion, and other religions that comprise less than 1.0% includes Muslim, Buddhist, and Jewish. Charlottetown's economy is dominated by the public sector. The provincial, federal, and municipal levels of government are significant employers in the central part of Queens County, as are the health care and secondary and post-secondary education sectors. Technology companies have increased their share of the city's workforce, however the actual numbers are quite small once call-centres are excluded. Other significant economic activities include light manufacturing, such as chemicals, bio-technology, and machining. Charlottetown City Hall is the seat of municipal government. The city's municipal government is structured around a council comprising a mayor and ten councillors elected using the ward system. The current mayor of the city is Philip Brown. Charlottetown has seven seats (out of 27) in the Legislative Assembly of Prince Edward Island. Some of these electoral districts occupy adjacent rural areas that are not within the city's boundaries. The city has a single seat in the House of Commons; the current Member of Parliament is Sean Casey. Charlottetown Airport is the province's only airport with scheduled passengers service. Historically, Charlottetown was the centre of the province's railway network. Highway development in the latter part of the 20th century has resulted in the city being the focal point of several important routes in the province. Route 1, the Trans-Canada Highway, partially bisects the northern suburbs, linking with Riverside Drive, the Hillsborough River Bridge and the North River Causeway/Bridge on a limited-access arterial highway linking the city with the Confederation Bridge in the west and the Northumberland Ferries terminal in the east. Route 2, the province's main east-west highway intersects with Route 1 in the city. Charlottetown Airport is the province's only airport with scheduled passenger airline service, serving 280,000 passengers per year. The absence of public transit for many decades in Charlottetown resulted in a dependence on personal use of automobiles, with municipal governments constructing three large above-ground parking garages in the city's historic district to house vehicles of downtown workers. The city also had a statistically higher proportion of taxis than the Canadian average as taxi service became a last-resort for many residents without access to a vehicle. Taxis in Charlottetown use a zone-based fare system as opposed to meters, and do not have a protective partition between the driver and passenger. The Charlottetown Harbour Authority operates the city's commercial port and is currently expanding a marine terminal which was formerly operated by the federal government. Importation of gravel for construction and petroleum products are the main port activities. Charlottetown is home to several campuses of Holland College, the provincial community college. English public schooling (gr. 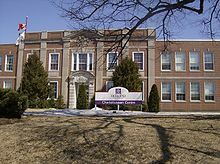 K-12) in Charlottetown is provided by the English Language School Board. French public schooling (gr. K-12) in the city is provided by the Commission scolaire de langue française. The city has two independent schools: Immanuel Christian School and Grace Christian School. Charlottetown is home to the University of Prince Edward Island. UPEI has programs in Arts, Education, Science, Business, and Nursing. The provincial university also houses the Atlantic Veterinary College. UPEI has a number of sport teams that compete in men's and women's hockey, soccer, rugby, basketball, and volleyball, and women's field hockey. These sports teams are called The Panthers. Charlottetown is also home to several campuses of Holland College, the province's community college. In addition, there are various private training colleges in the city. Troy Little – comic book artist, graphic designer, co-creator of "Angora Napkin"
James Wood – Commander of the Royal Canadian Navy. ^ "City of Charlottetown: Welcome to the City of Charlottetown". City of Charlottetown. Retrieved October 9, 2013. ^ a b c "An Act to incorporate the town of Charlottetown". The Private and Local Acts of the General Assembly of Prince Edward Island (Volume 1 ed.). ^ "(Code 1102075) Census Profile". 2011 census. Statistics Canada. 2012. ^ "(Code 0159) Census Profile". 2011 census. Statistics Canada. 2012. ^ "(Code 105) Census Profile". 2011 census. Statistics Canada. 2012. ^ a b Statistics Canada (2019). "Canada's population clock (real-time model)". Retrieved 2018-02-13. ^ a b c d "Interim List of Changes to Municipal Boundaries, Status and Names: January 2, 1991 to January 1, 1996" (PDF). Statistics Canada. February 1997. p. 41. Retrieved October 28, 2018. ^ a b c d e "Charlottetown A". Canadian Climate Normals 1981–2010. Environment Canada. Retrieved October 8, 2013. ^ "August 1935". Canadian Climate Data. Environment Canada. Retrieved 9 June 2016. ^ "January 1877". Canadian Climate Data. Environment Canada. Retrieved 9 June 2016. ^ "Charlottetown A". Canadian Climate Normals 1981–2010. Environment Canada. Retrieved 9 April 2016. ^ "Charlottetown CDA". 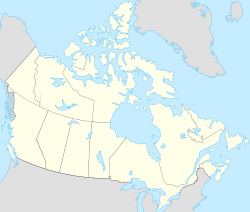 Canadian Climate Normals 1971–2000. Environment Canada. Retrieved 9 April 2016. ^ "March 2012". Canadian Climate Data. Environment Canada. Retrieved 9 June 2016. ^ "Tea Hill Cricket Pitch". Archived from the original on 2015-04-02. Retrieved 2015-03-18. ^ "Population estimates, July 1, by census metropolitan area and census agglomeration, 2016 boundaries". www150.statcan.gc.ca. Retrieved 2019-03-29. ^ Government of Canada, Statistics Canada (2018-07-11). "Canada's population clock (real-time model)". www150.statcan.gc.ca. Retrieved 2019-03-29. ^ Stewart, Dave (November 7, 2018). "Charlottetown mayor-elect Philip Brown talks plans and priorities". The Guardian. Retrieved November 8, 2018. ^ "Facts & Statistics". Charlottetown Airport. 2009. Archived from the original on 2008-06-20. Retrieved 2009-05-23. Wikisource has the text of The New Student's Reference Work article "Charlottetown".